Jazz-based products use IBM Rational Common Licensing (RCL) token service provider, which is an extension of the Jazz Team Server (JTS) that forwards token requests to an IBM Rational License Key Server (RLKS). Jazz-based products and non Jazz-based products can share tokens from same pool of tokens. Token licensing requires a Jazz Team Server (JTS) 3.0 or later. Customers with a valid entitlement to Rational Quality Manager 2.0.1.1, or a later service level, or Rational Requirements Composer 2.0.0.3, or a later service level, can consider Jazz Team Server (JTS) 3.0 or later as a “supported program” per the terms of the product license agreement, for the purpose of managing Jazz token license keys. Customers with a valid entitlement to Rational Team Concert 3.0 or later are permitted, per the terms of their product license, to run Jazz Team Server as a separate license server. Rational License Key Server (RLS) 8.1.1. This is included with your RRC, RQM, and RTC product packages on Passport Advantage. You have a number of options when configuring a token installation. The following picture shows a high level single server topology deployment of RTC using Token licensing. Customers using RTC 3.0 can find more help and explanation on configuring token service in the following sections of the article. 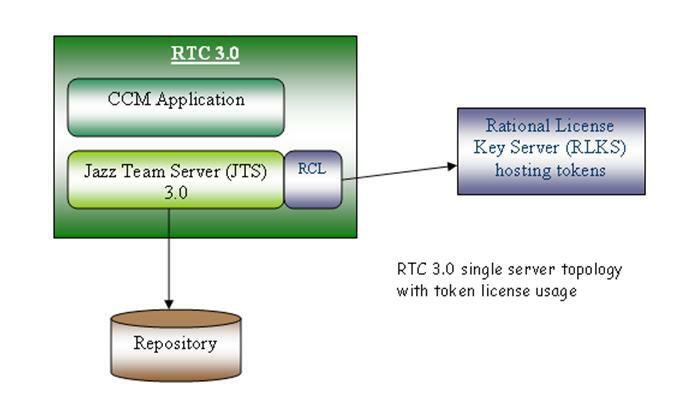 RQM 2.x and RRC 2.x products can take advantage of token licensing by installing and using JTS 3.0 as a license floating server. The following picture shows a high level deployment of RQM 2.x and RRC 2.x using Token licensing. Customers can find more help and explanation on configuring token service in the following sections of the article. The Rational License Key Center, https://licensing.subscribenet.com/control/ibmr/login, is where you’ll generate your license keys. Once a your purchase order is processed, you’ll receive a note with information on how to access Rational License Key Center. LicenseKeys (Licensekeys.zip): This file contains token entitlement information and the products that comprise your token order. This key will be installed on the Rational License Key Server (RLKS). Jazz Keys (JazzTokens.zip): This one or more Jazz token client access license activation keys. These will be installed on the Jazz Team Server (JTS). During the key generation process you’ll be asked for information to identify the computer on which the License keys (Licensekeys.zip file) will be installed (viz., Host ID and the Host Name). These fields do not apply to the Jazz Keys. The following instructions document how to install a license.dat (embedded in Licensekeys.zip) on a windows platform. Use the License Key Administrator wizard and select to Import a Rational License File or select the License Keys menu and then Import License Key(s). Select to import the license key file, license.dat. After a confirmation prompt, you’ll see licenses you imported listed on the License Key Administrator main window, as shows in the following picture. JazzToken is the name of Product key, and TLSTOK is the token list associated with the “JazzToken” product key. From the License Key Administrator dialog, select License Keys > Host Data. This will display identification information for the computer. Make a note of this information. Return to the Rational License Key Center and return the key you just generated by selecting View and Return Keys from the navigation bar on the left margin. Re-start the generation process and on the “Required Information” page, enter the information you noted from the License Key Administrator dialog. Generate the key again and import it. If the error persists, contact IBM Rational Customer Support or you IBM sales representative. On Windows, the Rational License Key Server is a Windows server. You’ll start it from the Windows Services dialog, which is available from the Control Panel. Install the Jazz token client access license keys, file JazzTokens.zip that you generated at the Rational License Key Center. Ensure you are logged on with JazzAdmins permissions. Starting at the main administration page, http://[hostname:port]/jts/admin, select Jazz Team Server – Server Administration and then License Key Management. In the Floating Client Access License Types section, select Add. In the Upload License Files dialog, upload your Jazz token client access license keys, JazzTokens.zip. When this completes, you will see token client access licenses listed in the Floating Client Access Licenses section, as shown in the following picture. Configure this Jazz Team Server to communicate with the Rational License Key Server that you installed and configured earlier. In the Floating License Server section of the License Key Management page, click the radio button next to IBM Rational Common Licensing Token Service to enable the service. Hover over the icon in the Actions column until you see the edit hover. Click the icon to view the Server Configuration dialogas shown in following picture. IBM Rational License Key Server: Provide the URL of the IBM Rational License Key Server you installed. This is of the form “port@hostname”. Token Lease Timeout: Specify how long a user can be inactive before the token expires. You can only make time interval longer. If the Jazz Team Server is able to connect to the Rational License Key Server, you’ll see a green checkmark on the IBM Rational Common Licensing Token Service line as shown in following picture. Run the LMTOOLS program. This is an executable that comes with the License Key Server. On Windows, it’s located in [LKS root directory]common. Select the ver Status tab and click on Perform Status Enquiry. Upgrade your RQM to 2.0.1.1 or later, your RRC to 2.0.0.3 or later, and/or your RTC to 3.0, or later. Import Token client access licenses to JTS 3.0. Use JTS 3.0 as licensing server for RQM, RRC, and/or RTC servers, as mentioned in above article. For RQM 2.x, RRC 2.x, Token client access licenses list would appear in corresponding product License management admin UI. For RTC 3.0, all licensing is managed within JTS 3.0. Remove current authorized license assignments and assign token license keys to your users. Uprade your RQM to 2.0.1.1 or later, your RRC to 2.0.0.3 or later, and/or your RTC to 3.0, or later. Install your existing floating license keys on the JTS 3.0, that also contains the token license keys. Verify existing RQM and RRC users continue to work with existing floating licenses, now managed by Jazz Team Server 3.0.